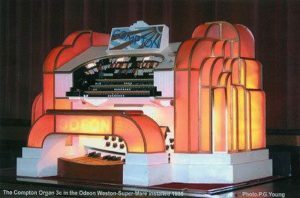 Weston-super-Mare has the only Odeon cinema in the west country that still has an original Compton theatre pipe organ performing in it’s original location. The Odeon is now a listed building with its Compton 3c/6 organ being maintained by the West of England Theatre Organ Society. With the works number A298, the organ was opened on 25th May l935. At the console was Alfred Richards who, in honour of his appointment, composed the song ‘Around the corner at the Odeon’. Although there are three manuals the top one is a coupler manual, so called because it does not have stops of its own but borrows from the other two. The organ has a rare Solo Cello stop which involves a mechanical bow and pitching fingers operated from the manual, although not in general use at present, restoration is planned. The six ranks of pipes are installed in two tightly packed chambers on the roof of the stage; speaking out through coves containing concealed lighting above the proscenium opening. The left-hand – or ‘Accompaniment’ – chamber contains the Open Flute and Violin cello ranks along with the Chrysoglott/Vibraphone unit and the non-tonal percussions and effects. The organ relays are also housed in this chamber. The remainder of the organ is in the right-hand – or ‘Solo’ chamber.